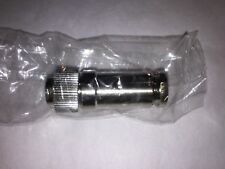 A brand-new 8 pin DIN 270° male plug connector, with the following specification: Suitable for hi-fi systems, radio and vintage computer games systems. Solderable pins and cable strain-relief. 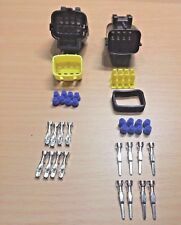 These connectors are easy to assemble, and easy to connect and disconnect when required. You can either solder to the connection pins or crimp them. 1x Male Plug Cable Guide. 1x Female Plug Cable Guide. 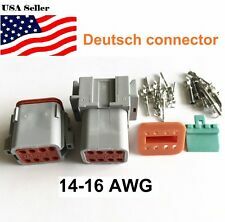 Deutsch DT06/DT04 12 Pin Engine Gearbox waterproof electrical connector for car bus motor truck. R04 SERIES. MADE IN JAPAN. 8 Pin Female In-Line Connector with Keeper Latches. 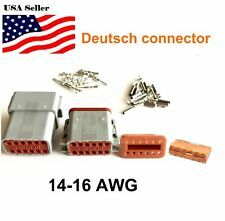 Deutsch DT08 8 Pin Engine Gearbox waterproof electrical connector for car bus motor truck. These connectors are great for a variety of electrical purposes, good uses are: LED Strip Connections, Customised PCB Circuits or Repairs, Arduino Interface connectors. Plug Specification. Pin Spacing: 2.54mm / 0.1". 8 WAY PLESSEY JONES PAIR. This type is an in line pair, 8 way cable mount 'free' or running male, together with a matching cable mount 'free' or running female, both halves have a galvonised pressed steel heavy duty housing. These are SIMILAR to P-308-CCT & S-308-RP. However, it is a rare version with a grounding pin instead of a normal pin. It will not make a difference if you are replacing both sides of the connector. DB9 Male to RJ45 Modular Adapter Ivory. RJ45 Pinout Pet Supplies. Cell Phones & Accessories. Molded ivory color housing. USEFUL LINKS. (Not Selected). Thumb screw. 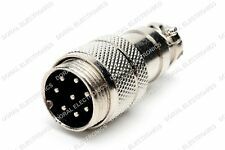 RJ45 Waterproof Connector Model: LLT-USA-RJ45-M1902 for Ethernet, LAN Network etc. M19 RJ45 8 pin Panel Mount Connector with attached Rear 5-3/4" Wire,waterproof IP67 Socket with Waterproof Male Cable strain relief. Strip of 5 Molex 522-07-2690 FPC connector 1mm pitch 26 way. you get a strip of 5 flexible printed circuitbord connector. Housing is required for cable mounting. Panel / Cable Mounting Multipole (8 Way) Connector. H/D/W: 35mm / 41mm / 18mm. Fixing centres: 33mm. This is a Lot of 4 NEW Amp / TE # 3-640599-8, 8 Position IDC Connectors for 18 Gauge Wire. Connection Direction: 90°. FC684218 Cliff Electronic Components Circular Connector Cliffcon Miniature Zc Series Plug 8 Socket Solder Cable Mount. Product Range: Cliffcon Miniature ZC Series. Gender: Plug. Connector Body Material: Brass. RJ45 Waterproof Connector Model: LLT-USA-RJ45-M1601 for Ethernet, LAN Network etc. M16 RJ45 8 pin Connector with Molded 8" Wire attached,waterproof IP68 with Cable strain Relieve. Waterproof Connector Specifications. Pitch Spacing: -. For Use With: AT Series Connectors. Product Range: AT Series. During that process you will be issued with an RMA number. NEW & ORIGINAL 5 Pieces. Copper Alloy. Through Hole.